This page collects information about nutritional facts and other properties of raw bananas in summary. The information on this and other food has been gathered from various sources and may not be totally accurate. Among the data shown in this website you can find information about proteins, vitamins and minerals from raw bananas and other nutrients like fiber, calories or cholesterol. The proportions of nutrients in raw bananas may vary depending on the type and quantity of food, and other factors that might contribute to the modification of its nutrients. Remember that depending on the preparation, raw bananas may vary their properties and nutritional characteristics. You can use this information to understand your dietary intake of this food or any other fruits and fruit juices. This can help you to cook better and healthier recipes including raw bananas, but remember to consult your doctor or nutritionist before beginning any regimen or make drastic changes in your diet. In your regular grocery store in the group of fruit you can find raw bananas among other available foods. Below you can see information about nutritional facts, properties and benefits of raw bananas for your body as well as the amount of each of its major nutrients. This food belongs to the fruits and fruit juices group. Banana - Musa acuminata, Musa balbisiana or a hybrid of the two, are also known as Plantains or cooking Bananas due to their higher starch content. The Banana plant is a native of Malaysia, Alexander the Great is credited with taking them to Europe, 327 BC. From Madagascar to eventually reach Guinea via the slave trade. Sailors carried them to the Canary Islands in 1402 and from there to the Caribbean by a Portuguese Franciscan Monk in 1516. Not long thereafter to Central America. Originally, bananas were small and derived their name from the Arabic word banan or little finger – the size of a banana. The Spanish called them platano, as they grew on a plane tree – the world’s largest Herb! On the occasion of the hundredth anniversary - 1876 of the Declaration of Independence, Americans got their first taste of bananas sold in tin foils for 10 cents, with practical instructions on their consumption. The banana heart is from where fruits develop in large hanging clusters that are made of tiers. A bunch has 3 to 20 tiers of up to 20 fruit per tier. Available year round, the most popular modern cultivar is Cavendish Bananas. A genetically modified disease resistant and slow ripening banana cultivar is being sought, as Cavendish is most prone to disease..
Bananas, more than any other fruit, are naturally mildly radioactive due to their potassium content and its isotopic component. Calcium, Iron, Manganese / Magnesium, Potassium, Phosphorus and Zinc. Traded as a major food crop in developing countries, bananas are used mainly for cooking. They can be cooked just like potatoes. Banana leaves are used as containers and easily disposable plates. Paper is made from the bark. Green bananas are stored in special rooms, filled with ethylene gas to induce ripening at destination. 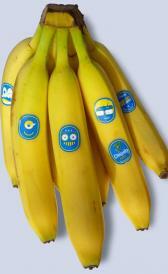 Bananas are refrigerated at 13.5 to 15 degrees Celsius, during transportation. Ripening stalls at lower temperatures. Tree ripening whilst best, reduces shelf life to 5 to 7 days. ‘Ungassed’ bananas are best suited for cooking. Transportation over long distances, from the tropics to world markets calls for special handling of plants and refrigerated ship’s to increase shelf life from 3 to 4 weeks. Bananas maybe stored in a polythene bag with an ethylene absorbent like potassium permanganate, in an inner carrier. At home, green bananas can be ripened in a brown paper bag overnight by including a tomato or apple. Banana growers in the Central American Republics and Caribbean were unable to compete with the likes of Dole and Chiquita, until governments provided them assistance and they banded in to Co-operatives. Although, India is the largest producer of Bananas, they are mostly used for domestic consumption. Although, now grown in US (Florida) the production is minimal. Like most bananas, Cavendish too is vulnerable to diseases. Panama disease produces gums and gels, caused by soil fungus while travelling through the roots and stem. The gel cuts off flow of water and nutrients and the plant wilts. In the next 10 to 20 years Cavendish Bananas may become unviable due to their identical genetic state, which prevents disease resistant evolution. Tropical Race 4 has wiped out Cavendish bananas in several countries. Other diseases native to different countries are also prevalent. Below is a summary table of key nutrients of raw bananas and a list of links to tables showing details of nutritional facts of raw bananas. They include the main nutrients as well as the proportion of each. The quantity of nutrients shown in the previous table, correspond to 100 grams of this kind of fruit.